Perfect, no odor at all, not a burlap feel to them, soft material, great length. Perfect for our 2 twin beds! Displaying exceptional versatility, the Burlap Natural Ruffled Bed Skirt is designed to complement any style. Made from natural shade soft cotton burlap with a gathered ruffle, 16-inch drop and finished with split corners to fit any bed frame. Beautiful skirt, shipped quickly. Was looking for a linen skirt to match all of the tan colors in the bedroom and couldn't find one for a reasonable price and was worried about how "burlap" would look. Was afraid it would look cheap and raggedy but it doesn't! It is quite a bit darker than any of the linen but it makes a great contrast and any tan-to-brown color will work anyway. I love it; the quality looks good and I had to have the splits at the corners to fit around the corner posts. Looks perfect and hits just a little above the floor on my tall bed. The burlap natural ruffled bed Skirt is perfect for my daughter's ocean themed room. I just wished it would have been lighter. It is more like a taupe color. 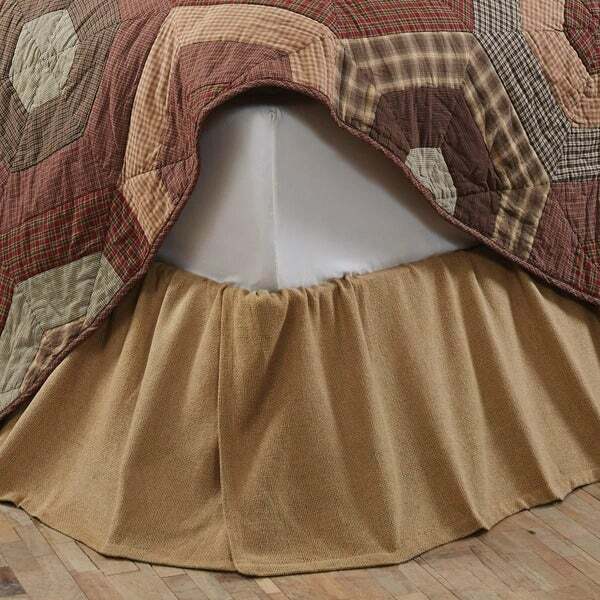 This Burlap Natural Ruffled Bed Skirt is Beautiful ! The fit is perfect , the flow is perfect, it even smells good! The platform fabric is very sturdy not thin like some and doesn't slip ! The weight of the burlap is perfect also and not see through. I am so fabulously pleased ! I would have expected a much higher price ! TY OVERSTOCK.COM !! I ordered this bed skirt after trying many different ones. I love the color and texture, it's different than the regular plain cotton ones. It does have a stiff, white sheet that goes under the mattress but it certainly doesn't effect the quality of the bed skirt. It does make it a little trickier to "pull" the skirt up, if needed. You will need to iron the skirt out of the package before you put it on but once ironed it looks great! I would definitely buy it again. Well made and hangs wonderfully. Long enough for tall beds. Doesn't have the odor like most burlap which is nice. I wanted to complete my primitive design with a ruffle. A perfect complement to my room! I love this bed skirt and have had many compliments on it. It goes well with my rustic country primitive quilt set. I washed it and it did have a lot of fuzz that came from it but it didn't hurt the look of it at all. At first I thought I had ruined it because I DID dry it in the dryer and it says to NOT to tumble dry. Not sure why it shouldn't be dried in the dryer because it came out fine. Adding this simple, well made bed skirt solved my decorating challenge beautifully. Its color highlights those same found in the patterned runner rug beside a differently patterned bed cover. The outcome is just what I hoped. It is not as full as pictured, however, thus only four stars. Best bed skirt I ever bought,,,,it goes with every quilt.. The perfect color ! 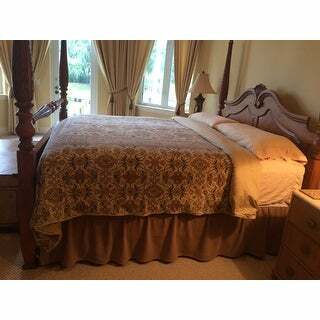 Hangs down perfectly and makes the bed looked finished and warm and cozy !! Fits perfectly on my king size bed. Excellent quality! It’s so difficult to find burlap items. Thanks for making my search easier. 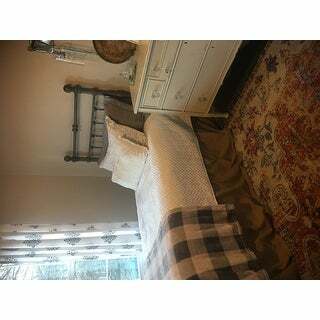 I love the Burlap Bed Skirt it's beautiful with my Americana Bedding and blends with everything. It is full and quality material, made really well. Excellent quality!! Would recommend this skirt for sure!! very good quality. A complement to my industrial rustic decor! Love this bedskirt! Just what I was looking for to go with a southwest type comforter and pillow ensemble. Unbelievable especially for the price. I looked everywhere before finding what I wanted. Looked good for burlap. returned. Seemed to be made well. "I am curious if the photo is showing this bedskirt on a 16” frame or a 14” frame. I am looking for a burlap bedskirt that works on an 18” drop bedframe. The bed skirt seems to be purposely made to drape the floor quite a bit. What is the exact length of the burlap? 16” or longer?" "gee-washing burlap, as instructions suggest (no dryer)....anyone with a success story?"